We take pride in our custom-made products...all lovingly made in the USA! Our custom items are all quality made in-house using quality materials and both domestic and high-speed industrial sewing machines. Our products are made-to-order and depending on the quantity and complexity could take anywhere from two days to three weeks to create (not including shipping time). We accept special custom requests and no job is too small. Contact us and let us know how we can accommodate you. The items shown below are just a few of our custom made products which are all made in the USA. Some products are our own designs. If interested in any of the products shown below, please email us info@missionpawsable.com. 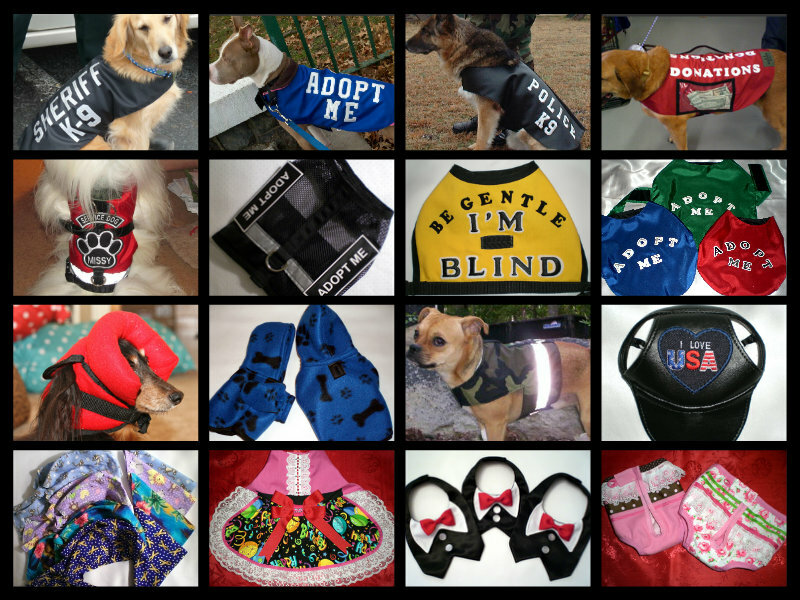 MISSION PAWSABLE (K-9 Apparel by Lena) - Just a variety of custom-made products all made in the USA. This adorable black satin tuxedo bib with white contrasting collar and red bow secures with Velcro at the end tabs of the strap. Size: It will fit neck sizes 12" to 14"
Wash delicate cycle in cold water and tumble try low. NOTE: This is a hand-crafted item and ready to ship. We currently use the United States Postal Service to ship our products domestically via USPS First Class and USPS Priority Mail. We ship to most international destinations. Buyer will be responsible for paying customs duty taxes, etc. (if any). Georgia residents will be charged the applicable tax.